Wake up your space with wall graphics and window clings! We have spent quite a bit of time this month producing and installing different looks for several companies who wanted to upgrade their spaces with visual branding and messaging through wall graphics, window graphics, and window clings. Cogeco Peer 1 is a managed hosting and cloud service company located in Vancouver, British Columbia. We were contacted by them in early June by Sarah Kautz. The company was in the process of moving their Atlanta offices from one floor to another in downtown. Cogeco has specific branding standards and looks for their offices that are unique to their industry. Sarah was referred to us by another one of our customers, Hannan Construction, and was looking for a fast turnaround time on this job. They contacted Pinnacle to install the brand image and look for their doors and office space with window and wall graphics. The graphics were very large in that the entire wall mural was 40 feet long and 9 feet tall, creating an interesting challenge for our company – not just for producing the graphics but for also installing them. There was also a 12” tall border that had inspirational words that the company wanted to run along the entire top of the office. Once the artwork was submitted, we went into production with the graphics and scheduled installation. Cogeco had logos installed on both double glass doors leading into their suite in downtown Atlanta. They also upgraded the appearance of their wall space with wall graphic messaging that plays off the company’s mission and competencies. The window and wall decals provide branding space that instills company pride in their office space. Our team was able to complete the job on Sarah’s fast time schedule and within the company budget. Sarah is very happy with the service and quality she received from the entire Pinnacle team. Brian at Maintenance Supply Headquarters contacted Pinnacle about installing some window clings on a specific date and during a very specific timeframe. After being able to comply with their request, we discovered that the installation was for the College Football Hall of Fame in Atlanta. The design requirements involved using the company provided artwork on static cling material installed on a row of windows inside the facility near the main field (main floor) of the building. 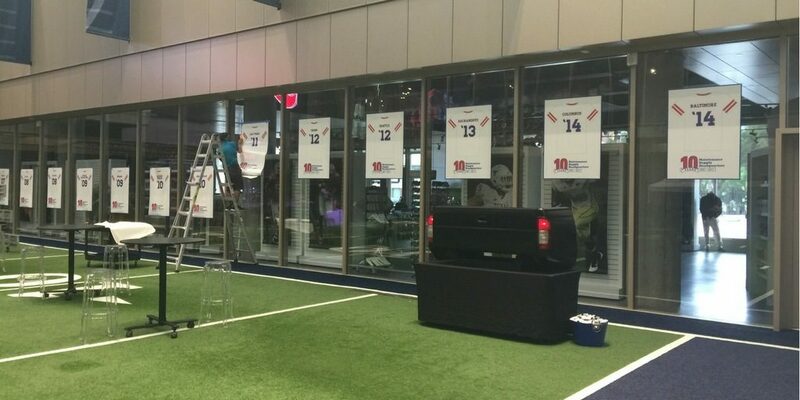 Our team completed the work by installing the static cling images between 5 and 8 pm after hours. The facility wanted removable cling material graphics so that the artwork could be replaced after a certain period of time with minimal work. Just down the street from us, our new neighbor the Savage Jerky Company reached out to us to add some pizazz to their home office. We had recently completed work for the company by providing decals for their truck, and they wanted to take that branding into their new office space. Brad, the owner, reached back out to Pinnacle and came down to our location for a tour of our facility. Upon seeing our capabilities with our routers, he initially asked about a lobby sign. Misty showed Brad a few options and he decided to go with PVC letters with brushed aluminum veneers for their front interior space. 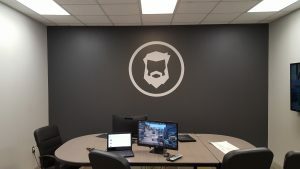 Along with the lobby sign, he also wanted something inside their conference room, so we created and printed a vinyl logo (the bearded face) and installed that in the conference room. Although he is in an office park, we recommend you check him out. Savage Jerky is open to the public, and his jerky is great! Window clings and graphics and wall graphics can be used in permanent or temporary formats to convey logos, messages, mission statements or just to enhance custom wall art. Choosing to use these types of graphics can enhance both your office space and provide a constant reminder for employees about their mission and goals within a company. 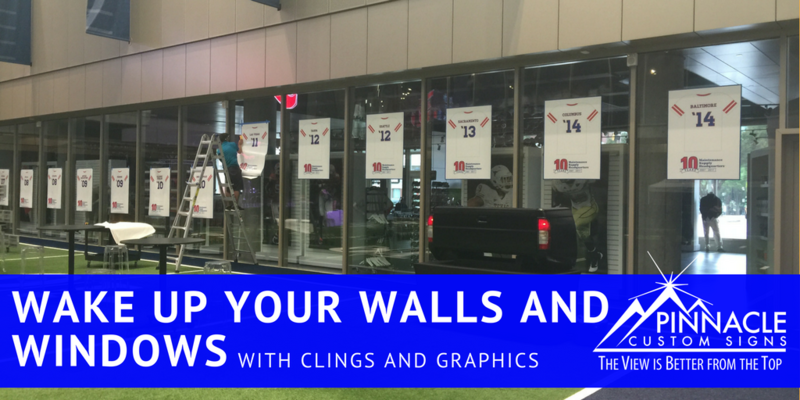 For more information or a free consultation on how to enhance your vacant spaces through use of graphics on windows, walls or doors, give us a call.